Today I am sharing a card made using the Stampin’ Up! 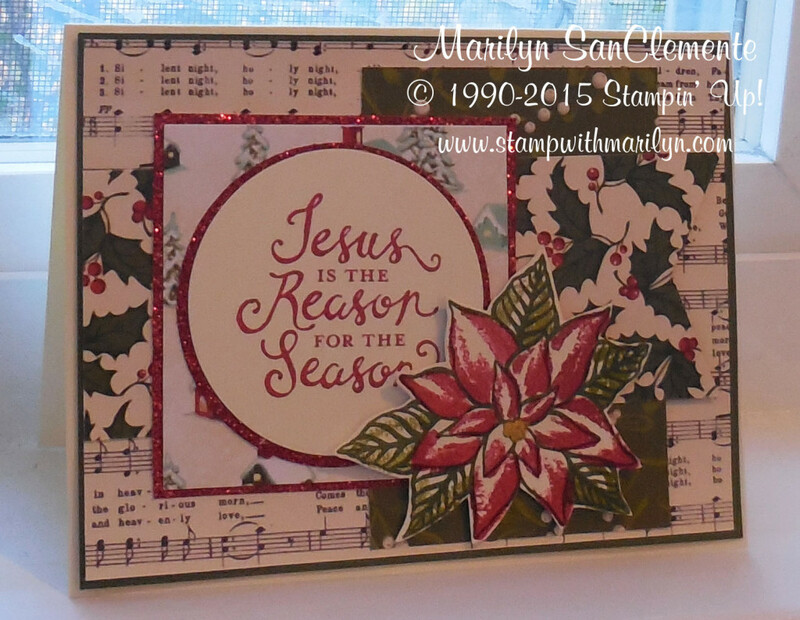 Reason for the Season stamp set. Poinsettias are my favorite Christmas flower so of course I had to have this set! This card is inspired by the Mojo Monday sketch challenge. Even though this card looks complex it isn’t. The secret to this card is the layers. I layered each piece of Home for Christmas Designer paper with a coordinating cardstock. With this card I used Mossy Meadow cardstock and Red Glimmer paper to outline the layers. The card base is Very vanilla cut to 8 1/2″ x 5 1/2 and scored at 4 1/4″. The next layer is a piece of Mossy Meadow cut to 5 3/8″ x 4 1/8″. I selected the Music pattern from the Home for Christmas Designer paper as the background paper for the card. Next is a 2 1/2″ x 3 1/2″ piece of designer paper with the Mossy Meadow Vine design. The Banner is a piece of Holly designer paper cut to 2″ x 5″. Next is a 2 3/4″ square of Designer paper with the house pattern layered onto a piece of Red Glimmer paper cut to 2 7/8″ square. The circle in the center is cut using the Circle Framelits. I used the 2″ Circle Punch to layer this onto a piece of Red Glimmer Paper. The center is stamped with the message “Jesus is the Reason for the Season”. Last but not least is the poinsettia. This is a two part stamp which is great for allowing you to stamp an image with multiple colors without having to do lots of coloring! 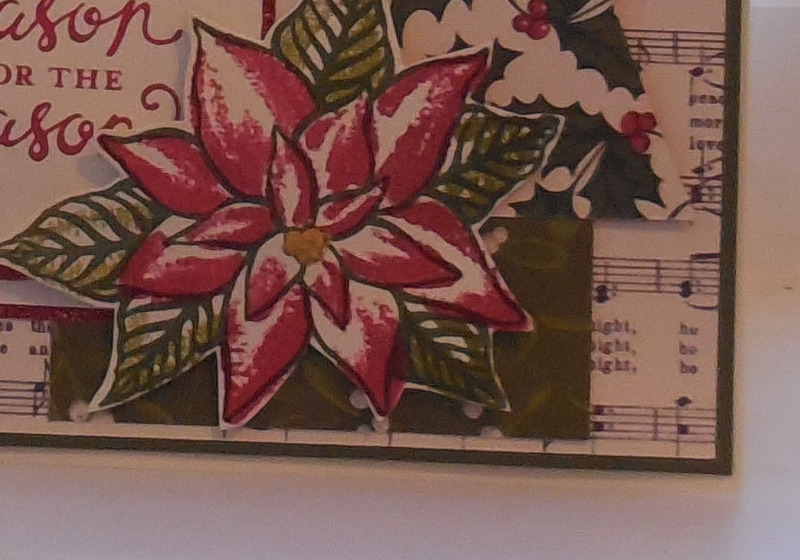 The outline of the poinsettia is stamped with Mossy Meadow ink. Next I stamped the flower with Read Red ink. The leaves are stamped with Old Olive ink to show the details of the leaves. I added a touch of Gold Dazzling Details to the center of the flower. Here is a listing of the products that I used for this card. So beautiful! Love that poinsettia. Thanks for playing along with Mojo Monday!